The Devonian period is an interval of about 57 million years defined on the geologic time scale as spanning roughly from 416 to 359 million years ago (mya), and being noteworthy as a period of great diversification of life with the first appearance of amphibians, seed-bearing plants, sharks, lobe-finned fish, and ammonite mollusks. The Devonian period is the fourth of 6 periods making up the Paleozoic era within the Phanerozoic eon, which includes the present time. The Devonian period lies between the Silurian and the Carboniferous periods. The full range of life on Earth included arthropods, like insects and spiders, beginning to colonize terrestrial habitats as the seed-bearing plants spread across dry land, forming vast forests. In the seas, a great abundance of forms of fish developed and proliferated to the extent that the Devonion period has been called the "Age of the Fish." The proliferation of so much plant life drained much of the carbon dioxide from the air, so much that the subsequent reduction in carbon dioxide's greenhouse warming effect may have contributed to the planetary cooling correlated with the Late Devonian extinction, which severely reduced the diversity and abundance of marine life. The paleogeography was dominated by the supercontinent of Gondwana to the south, the continent of Siberia to the north, and the early formation of the small supercontinent of Euramerica in the middle. The Devonian period marks the beginning of extensive land colonization by plants. With large herbivorous land-animals not yet being present, large forests could grow and shape the landscape. The history of life, like the history of an individual, involves stages of development. The Devonian Explosion of many new forms of plants, and the diverse types of animal life that appear, as well as the extinction of many forms in the Late Devonian Extinction, paved the way for the present-day. The period is named after Devon, England, where rocks from this period were first studied. While the rock beds that define the start and end of the period are well identified, the exact dates are uncertain. According to the International Commission on Stratigraphy, the Devonian extends from the end of the Silurian 416.0 ± 2.8 million years ago (mya) to the beginning of the Carboniferous 359.2 ± 2.5 mya (in North America, the beginning of the Mississippian subperiod of the Carboniferous) (ICS 2004). The Devonian is also known as the Age of Fishes, but the term is out of favor. While fish underwent a major radiation, it was only one of several major landmarks during the period, and other lifeforms were more common. The Devonian has also erroneously been characterized as a Greenhouse Age, due to sampling bias—most of the early Devonian-age discoveries came from the strata of western Europe and eastern North America, which at the time straddled the Equator as part of the supercontinent of Euramerica. Fossil signatures indicate widespread tropical climates that were warm and moderately humid. Even more rarely, the Devonian is also known as the Old Red Age, after the red and brown terrestrial deposits known in the United Kingdom as the "Old Red Sandstone" in which these early discoveries were found. Devonian rocks are oil and gas producers in some areas. 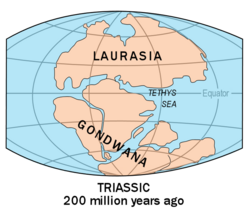 A depiction of Gondwana and Laurasia, albeit 200 million years after the Devonian. The Devonian period was a time of great tectonic activity, as Laurasia and Gondwanaland drew closer together. The continent Euramerica (or Laurussia) was created in the early Devonian by the collision of Laurentia and Baltica, which rotated into the natural dry zone along the Tropic of Cancer, which is formed as much in Paleozoic times as nowadays by the convergence of two great air-masses, the Hadley cell and the Ferrel cell. In these near-deserts, the Old Red Sandstone sedimentary beds formed, made red by the oxidized iron (hematite) characteristic of drought conditions. Near the equator, Pangaea began to consolidate from the plates containing North America and Europe, further raising the northern Appalachian Mountains and forming the Caledonides in Great Britain and Scandinavia. The west coast of Devonian North America, by contrast, was a passive margin with deep silty embayments, river deltas, and estuaries in today's Idaho and Nevada. An approaching volcanic island arc reached the steep slope of the continental shelf in Late Devonian times and began to uplift deep water deposits, a collision that was the prelude to the mountain-building episode of Mississippian times called the Antler orogeny. The southern continents remained tied together in the supercontinent of Gondwana. The remainder of modern Eurasia lay in the Northern Hemisphere. Sea levels were high worldwide, and much of the land lay submerged under shallow seas, where tropical reef organisms lived. The deep, enormous Panthalassa (the "universal ocean") covered the rest of the planet. 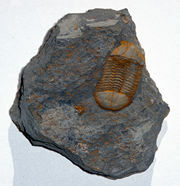 Fossil trilobite Ductina vietnamica from the Devonian of China. Sea levels in the Devonian were generally high. Marine faunas continued to be dominated by bryozoa, diverse and abundant brachiopods, and corals. Lily-like crinoids were abundant, and trilobites were still fairly common, but less diverse than in earlier periods. The ostracoderms were joined in the mid-Devonian by the first jawed fishes, the great armored placoderms, as well as the first sharks and ray-finned fish. The first shark, the Cladoselache, appeared in the oceans during the Devonian period. They became abundant and diverse. In the late Devonian the lobe-finned fish appeared, giving rise to the first tetrapods (four-legged vertebrates). A great barrier reef, now left high and dry in the Kimberley Basin of northwest Australia, once extended a thousand kilometers, fringing a Devonian continent. Reefs, in general, are built by various carbonate-secreting organisms that have the ability to erect wave-resistant frameworks close to sea level. The main contributors of the Devonian reefs were unlike modern reefs, which are constructed mainly by corals and calcareous algae. They were composed of calcareous algae and coral-like stromatoporoids, and tabulate and rugose corals, in that order of importance. By the Devonian period, life was well underway in its colonization of the land. The bacterial and algal mats were joined early in the period by primitive plants that created the first recognizable soils and harbored some arthropods, like mites, scorpions, and myriapods. Early Devonian plants did not have roots or leaves like the plants most common today, and many had no vascular tissue at all. They probably spread largely by vegetative growth and did not grow much more than a few centimeters tall. 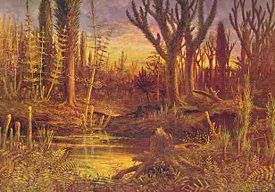 By the Late Devonian, forests of small, primitive plants existed: Lycophytes, sphenophytes, ferns, and progymnosperms had evolved. Most of these plants have true roots and leaves, and many were quite tall. The tree-like ancestral fern Archaeopteris, grew as a large tree with true wood. These are the oldest known trees of the world's first forests. By the end of the Devonian, the first seed-forming plants had appeared. This rapid appearance of so many plant groups and growth forms has been called the "Devonian Explosion." The primitive arthropods developed with this diversified terrestrial vegetation structure. The evolving co-dependence of insects and seed-plants that characterizes a recognizably modern world had its genesis in the late Devonian. Also in the Devonian, both vertebrates and arthropods were solidly established on the land. The "greening" of the continents acted as a carbon dioxide sink, and atmospheric levels of this greenhouse gas may have dropped. This may have cooled the climate and led to a massive extinction event, known as the Late Devonian extinction. The late Devonian crash in biodiversity was drastic. McGhee (1996) estimates that 22 percent of all the families of marine animals (largely invertebrates) were eliminated, some 57 percent of the genera went extinct, and at least 75 percent of the species did not survive into the following Carboniferous. ↑ Kaufmann, B. and Trapp, E.; Mezger, K. (2004). The numerical age of the Upper Frasnian(Upper Devonian) Kellwasser horizons: A new U-Pb zircon date from Steinbruch Schmidt(Kellerwald, Germany). The Journal of geology 112 (4): 495-501. ↑ Algeo, T.J. (1998). Terrestrial-marine teleconnections in the Devonian: links between the evolution of land plants, weathering processes, and marine anoxic events. Philosophical Transactions of the Royal Society B: Biological Sciences 353 (1365): 113-130. ↑ Northern Arizona University, Devonian Paleogeography Retrieved September 22, 2007.
International Commission on Stratigraphy (ICS) 2004. Retrieved September 22, 2007. McGhee, G.R. The Late Devonian Mass Extinction: the Frasnian/Famennian Crisis. New York: Columbia University Press, 1996. Ogg, Jim. Overview of Global Boundary Stratotype Sections and Points (GSSP's). 2004. http://www.stratigraphy.org/gssp.htm Retrieved September 22, 2007. This page was last modified on 12 July 2016, at 19:33.